We also learned that leading companies are putting enormous efforts into open innovation, where they’ll deliberately look outside the organization for ideas and solutions. This week Paul Sloane shares more insights about what it takes to be a great leader and how to have passionate, energetic people willing to strive for the organization’s vision—which always requires new ideas and change. VB: If you were running your own business would you hire a science fiction writer? Paul Sloane: I think you need people who are disruptive. You need people who are challenging. You need people who will challenge the thinking of the team. You need people who are counter-cultural. But we tend to hire people in our own image. We tend to hire people who will fit in. People get rejected because they won't fit in. A good question in your HR department is, would a young Bill Gates, a young Steve Jobs or a young Richard Branson come and work in this company? Most companies wouldn't hire Bill Gates. He didn't finish his university degree. Richard Branson didn't go to university. Disruptive people seem to act superior, are arrogant and ask a lot of insolent questions about how the organization does things. That's assuming these types of people would apply in the first place. You've got to ask yourself the question, "would we attract a really talented person and, if a really talented person walked in the door, would we recognize that person and accommodate them?" There is an expression, "troublesome talent"—people who are a little bit hard to manage, but they're talented and you need some of those. You want people who are constructive and challenging—counter-cultural rebels. You don't want cynics. You don't want people who are always against you, but you do want people who will challenge you. VB: The other side of this question is how to retain those disruptive people rather than label them as a problem employee. Paul Sloane: They are often seen as a problem employee and they often leave and start their own business. I give examples of that in the book of people who go to their boss with a great idea and their boss rejects the idea. Then they leave and do it on their own. Some people like to be told exactly what to do—they like to have a predictable routine every day. Many other people find that type of work frustrating and they want to be empowered and allowed to try things. If you give them that freedom, you will get all sorts of fantastic ideas out of them. That's what's Google does with its famous one-day-a-week rule, where anyone can look into business issue that interests them. Twenty percent of their talent—which may appear to be a fantastically extravagant approach—but they have had some wonderful innovations as a result. VB: Promoting creativity and innovation means you have to be prepared to dedicate money and resources. Paul Sloane: Yes, you have to dedicate time, some money, and some people for innovation. You don't get innovation for free. A lot of the money you spend on innovation will be wasted. You'll try things that don't work. It's the nature of innovation. You can't guarantee all the things that you try will work. In fact, if everything you try works, the chances are you're not being bold enough—you're being too incremental in your approach. VB: You say that rather than new products and services, new routes to market can be more effective in gaining a competitive advantage and could be the best innovation investment a company can make. Would you explain what you mean by new routes? Paul Sloane: It's a new way of getting to market, a new way of getting your products in front of the key customers you're trying to reach. New routes to market are exemplified by Amazon intermediating all of the booksellers or low-cost airlines that encouraged their customers to book tickets over the Internet rather than through travel agents. Encyclopaedia Britannica had a very good model of knocking on doors and selling very expensive encyclopaedias. But then along came Encarta which is a cheap, nasty, low-quality product, but it killed Britannica's model, because it was so easy to distribute. You could download patches, and you could do searches. Now Encarta has been replaced by Wikipedia, which is an entirely different business model, an incredible business model, where you get volunteers to build the whole massive infrastructure. Wikipedia is a large company with a huge amount of data and the data is maintained effectively by an army of volunteers. It is a new route to market, a different approach. VB: And there are new routes yet to be discovered and explored? Paul Sloane: All the time. I was reading today about Wikitude, a facility that allows your mobile phone to be an intelligent guidebook. When you visit a new city, you point the phone at a building and it takes a photograph of the building. Wikitude recognizes what the building is and you are given information such as when it was built, who the architect was, if somebody famous had lived or died there or anything else of interest. You don't have to identify the building, the system can figure it out. Now that's an amazing innovation. For somebody like me that travels a lot, that kind of product is really interesting—it is apparently on the market now. VB: Is asking, as you suggest, "Who killed our business?" a proven way to spark lateral thinking that can lead to useful, radical innovation? Paul Sloane: I use that question at some workshops with clients. Instead of saying "let's start from today and think forward," we say, "let's think ten years in the future and look back." For example, if Polaroid employees had a meeting today, they could look back and say, "Polaroid was a fantastic company, it was really successful, it did really well, but digital camera technology came out of left field and killed us stone dead. We weren't ready for it. We didn't react fast enough and it put us out of business." Leaders should do the same with their companies. Whatever added value is being provided at the moment, I want you to think forward seven or eight years and imagine something that comes along which kills you, which provides the added value you provide to customers but in a cheaper, easier, and more effective way. It might reach your customers with a better offering. It might be new technology, a new means of distribution, a new fashion, or an entirely new approach. Think of what it might be—there will be many possibilities—and then design the ideal company to deliver that added value. I used this approach with a major Ministry for Education organization in the UK. The participants came up with a combination of Harvard Business School, Microsoft, and a major TV network to effectively replace what they are doing but with the added value of being delivered in a more attractive fashion. I also posed this question to a group from a major systems integrator that had developed tools to provide IT solutions for their customers. They said if all of their intellectual property was in the public domain and provided over the Internet, a small, highly professional company in India could out maneuver them and be much more cost effective. The approach forces a group to find an entirely different model starting with a clean sheet of paper. If you weren't starting where you are today how would you do it? When you come up with ideas for different business models you can then consider whether one or more of them should be implemented. The next step might be to spend some money to investigate how the new business models might work? VB: Would you talk about the importance of leaders having a vision, communicating their support for innovation and being passionate about it? Paul Sloane: That's the single most important thing. It's the starting point, because it's hard to have an innovative organization if the leader doesn't believe in innovation. Most CEOs will say they believe in innovation. But many only pay lip service to it. They say one thing and act differently. They micromanage their people, crush out new ideas, and impose their own views. That's not the way to do it. The really innovative leaders have a vision for change and they say, "we're here today, but we're going to be somewhere different tomorrow and I need your help to get there. You're close to the action. I want you to find the ways to achieve the change. It's a risky journey but I need your help to plan that journey." The goal may be to go from the kind of business you are today, which is really good, to a business model where you're doing twice as much with half the resources in half the time and in different markets. You need a vision which is credible but challenging, and then people will innovate to achieve it. VB: Having a VP of Innovation may be the wrong approach unless the CEO is messaging the priorities of innovation? Paul Sloane: The CEO should be the Senior VP of Innovation. It's quite dangerous to appoint a VP of Innovation as everyone may think it's his job, not mine, to be innovative. It must be clear that it's everyone's job to innovate. When the total quality movement came into being in the 60s, we had quality directors, quality management, and quality circles. Now quality is everyone's job. You don't have a Quality Director any more. Everyone's expected to deliver quality the first and every time. So with innovation. It's not one person's job, it's everyone's job to find new and better ways to do things. The CEO has to reinforce that expectation with strong messages and by allocating resources to innovation. That's not to say you can't have incubating units, where new ideas are developed. But you shouldn't say it is primarily one person's job to innovate and everyone else's job to execute. VB: The language we use is important in generating a climate that encourages others to be positive and creative. You note the difference in the number of ideas generated when employees are asked for ideas on how to improve productivity compared to being asked how their job can be made easier. You also advise using supportive, constructive, and inspiring words, and posing questions that seek ideas and input rather than giving instructions. Does that mean emotion plays an important part in being a great innovative leader? Paul Sloane: I think so. Great leaders always have a vision and they take people on a journey. The journey is most often risky, but it's a journey that people believe is worth making. Most CEOs don't use emotion. They don't use feeling. Instead they use spreadsheets, PowerPoint presentations, graphs, figures, and percentages—and their people don't get excited. People get excited about vision for change and a better world. The mission statement for GlaxoSmithKline is not, we want to be the leading pharmaceutical supplier and in the top quartile of customer service. It is, we want to improve the quality of human life by enabling people to do more, feel better, and to live longer. That vision to have people live longer has worked well as people feel it's worth doing something about it. One of the messages from Barack Obama is that he had a vision and he expressed the vision with great oratory, feeling, and emotion—and people connected with that vision. Barack Obama has a vision for change and he embodies that vision for change. VB: Is the most important aspect of the relationship innovative leaders have with their employees that they trust them and that the employees know they are trusted? Paul Sloane: It's one of the most important things if not the most important. People need to be trusted and empowered—trust leads to empowerment. Trust is a two-way thing that is built up over a period of time. You don't say to everyone, "do whatever you want and here's 50,000-dollars to try it. Some people you can trust and empower. Others you can't and they need more supervision. The innovative leaders are flexible in the way they manage people, projects, and the degree of empowerment they give their employees. They are typically always looking to give more empowered, delegate more authority, give people more freedom to push decision-making close to the action, and to run slightly out of control. The control freak that likes to micro manage everything and know in detail what's going on in every aspect of the business is the antithesis of the innovative leader. The innovative leader is someone who is constantly empowering, constantly challenging people to come up with better ways to do things and giving them the opportunity to try. They are comfortable with the risks that it involves. VB: You advise leaders to welcome, talk about and even reward honourable failure—an honest attempt at something new or different that was unsuccessful. This in contrast to incompetent failure due to lack of effort or competence. You identified some examples where this is extant, such as the Silicone Valley in California. Are business leaders in the UK or other parts of Europe hearing this message? Paul Sloane: I think so. But it's a difficult message. It's particularly difficult in government and in government agencies to accept the concept that you can waste money on things that don't work. That's what innovation involves. You need that type of thinking and an attitude that absorbs the cost of failure if somebody tries something and it doesn't. Of course this applies to honourable failure, where somebody tries something that has never been tried before and it doesn't work. We often confuse honourable failure with incompetent failure. We say failure is bad, we don't want failure. We want to get it right the first time every time. We want to eliminate errors and use the language of quality. Of course, if somebody is doing a routine job and making mistakes all the time, the best thing to do is fire them. You try and you coach and give them an improvement plant, but if they're really useless move them out. If somebody is constantly trying new things and many don't work, you should applaud that person. Richard Branson has started over 200 businesses in the Virgin Group—many have failed but he keeps trying. He's always trying new businesses and some of them pay off big time. You need that kind of attitude. An entrepreneur is somebody who slips and falls, gets up and tries again. We need that trait in our employees. And we need that approach in the public sector, hospitals, and even in education. We need people to be trying things in small ways to discover what works and what doesn't. VB: Are you encountering entrepreneurial thinking in the public sector? Paul Sloane: Yes, because they can't spend their way out of their problems. That approach hasn't worked. We've spent loads of money on hospitals, schools, prisons and other major public services and it hasn't fixed the problems. We've doubled the amount of money spent for an outcome that is maybe only ten- or fifteen-percent better. We've got to find smarter and better ways to do things and when people do that they should be rewarded. But in general, in the public sector, the risk-to-reward ratio is much lower than the private sector. If people in the public service come up with a great idea and it is implemented, they should be rewarded. The tendency is, if an idea fails there is blame and criticism and careers are negatively affected. This results in a tendency to keep your head down, do what you're told, and wait until you collect your pension—clearly not the kind of attitude that's needed. VB: You suggest CEOs and leaders should issue a declaration of innovation that becomes a manifesto for change and becomes part of the DNA of the organization. One of the elements you recommend be included is looking for ideas from all sources, including outside the organization. What are some of the innovative ways companies you are familiar with are seeking ideas from outside their organization? You mentioned Procter & Gamble. Are there any other ways? Paul Sloane: There are lots of innovative ways to look outside. You can have people dedicated to this activity. At Bristol-Myers Squibb there's a woman whose title is "Idea Searcher." If you come up with a challenge, you give it to her to generate ideas. She might run a brainstorming session, identify an intermediary on the Internet, go to the universities, post something on a blog on the Internet. She won't solve the problem but she will come up with 20 great ideas for you. It's a question of being open to ideas from anywhere, any place, and at any time. Many people do it through their own Internet site, but they can also do it through idea-generating sites, meetings with networking organizations, or collaboration with universities. At a university you could invite students to a pizza party and ask them for ideas for your problems. The students may come up with some creative ideas you would never think of and it costs you very little. VB: When talking about open innovation, you observe that a network of collaborators from outside one's organization can speed up processes, reduce costs, generate more innovative ideas, and reduce time to market. This seems like a winning strategy? Paul Sloane: Yes. It's a question of finding the right collaborators, looking for partnerships. Collaborative people spark off each other in a creative and constructive way. It works well when it's done well. VB: You observe that average expectations about a company's revenue growth encourages its employees to think and act "averagely." Stretched or drastic expectations reinforce a culture of innovation and innovation goals. How does a leader know when the stretched expectations are far-reaching enough without being so high as to create a feeling of hopelessness? Paul Sloane: That is tricky, there's no question, and it depends on the climate in the organization. Given the current economic conditions any kind of growth would be quite remarkable for many organizations. It's a question of setting targets that are challenging but achievable while, at the same time, emphasizing that the way to get there is not by doing five-percent more and working five-percent harder. It's by doing something different and working smarter. But, as you say, you've got to be careful because if as a leader you expect double-digit growth in revenues in the next year and it is completely unrealistic, it'll demoralize people. VB: You mentioned today's financial crisis. Would you say today, more than ever, innovation is called for? Paul Sloane: Yes I would. The companies that do really well and will come out of the other side of this recession in good shape will be the agile ones, the ones that have found new and better ways to deliver the goods or services customers want. Not the companies that cost cut, hunker down, save money, and have a survival strategy. It's important to survive, manage costs, and look for ways of eliminating waste. But that doesn't mean you should eliminate your innovation budget. You need to allocate some time, money, and people to finding new and better ways to do things. The recession will create opportunities as well as threats and you've got to have an attitude and a message that says we're going to be lean, we're going to be mean, and we're going to survive—but we're going to survive by being smart and finding new and better ways to do things. VB: Organizations that want to be highly innovative need to hire creative people and create a culture that promotes innovative thinking. Is it your experience that organizations often fall short by not providing creatively talented employees with the training required to develop skills and expertise in innovation? Paul Sloane: Yes, but an even bigger problem is when organizations train their employees but then don't empower them to try out things. I've worked with a number of organizations where I have been brought in to provide leadership and innovation training to their bright young graduates and high-potential young managers. The employees taking the training say, "all this training is great, Paul, but when we return to our operational units, we don't have the freedom to try out these innovation skills nor to implement innovative ideas." The approval process is often thought to be too long-winded, too heavy-handed, and they have to go through too many layers before they can try anything new. Training is good but it has to be aligned with a complete culture shift in which experimentation is encouraged and the processes are aligned to allow fast approval for small ideas and an efficient process for evaluating big ideas. VB: Would you tell us about the services Destination-Innovation offers? 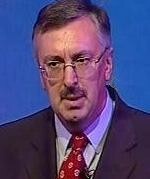 Paul Sloane: I work with some associates to give keynote talks at business conferences and events. We provide training in creativity, lateral thinking, and in the leadership of innovation. I like to work with teams of senior people often facilitating meetings to develop strategies, look at innovation, and generate ideas for a particular challenge they've got. An example might be, how do we approach a new market? How do we change a brand image or make other significant changes? I facilitate and encourage the team to look at things in new ways. It's a lot of fun and challenging. VB: Following your advice on how to define the business we are in, what value do you provide your customers? Paul Sloane: Good question. I provide them with stimulation and a new way to approach things. I get them to think hard about the business they're in and how they're approaching innovation. I hit them over the head and get them to think about things in new ways. The goal is to lead to meaningful innovation, an improved climate for change in the business and, therefore, increased revenues and higher profits. Plus an improved place to work. VB: Do you contribute lots of new ideas in those sessions? Paul Sloane: I try not to, as that's not my role. Although I often come up with ideas, I don't go to a company to give them my ideas related to their problems. I usually work with a diverse team from different work groups, ages, and experiences with the goal of enabling the group to generate ideas and select the best ideas. At the end of a session you will have many good ideas developed to a stage that you can then choose which to pursue further. The people on the team generate and consider their ideas with support from my techniques and skills of facilitation. Sometimes I'll prod, share what somebody else has done, or offer some starting points. But I prefer the group to acquire the innovation skills because, when I leave, they can carry on. VB: Do you also help them with implementation—the initial steps toward implementation, so they don't lose momentum? Paul Sloane: Typically not, because there isn't enough time. Typically I get involved in the front-end—leadership, creative thinking, idea generation, and evaluation. Implementation of the ideas is more of a project management function which isn't my core skill set. I mention this aspect in my books. I understand what the general approach to implementation is, but I'm more interested in the front-end of innovation. VB: Are there are any authors or other books that you recommend? Paul Sloane: The Innovator's Dilemma: When New Technologies Cause Great Firms to Fail by Clayton Christensen. Gary Hamel's ideas are excellent and his new book, The Future of Management, is wonderful. Blue Ocean Strategy: How to Create Uncontested Market Space and Make the Competition Irrelevant by W. Chan Kim and Renee Mauborgne. Also, Henry Chesbrough has written several books about open innovation. 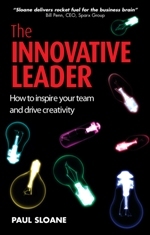 VB: Is there anything more to be said about creativity and innovation that you did not include in The Innovative Leader? Paul Sloane: It wasn't my first book. I wrote another book on innovative leaders called The Leader's Guide to Lateral Thinking Skills. I'm working on another book at the moment. It's going to be hard for me to top The Innovative Leader, but I'm working on some new ideas about something slightly different. VB: So we can look forward to another book soon? Paul Sloane: It's another year away, I would say. VB: I have enjoyed talking with you. It's a pleasure to chat with a lateral thinker. Paul Sloane: Well thank you. I hope you found it useful. covers a of ground about innovation. In addition to advice on how to be an innovation leader and build a creative culture, it covers ideation, implementing innovation processes, and even personal creativity. For example, logic and analytical thinking can often kill a good innovative idea—we may need to give more trust to our intuition about innovative ideas. Paul Sloane is an author and speaker of creative problem solving and lateral leadership. He is the founder of Destination-Innovation, which helps organizations improve their innovation. Paul lives in Surrey, England.